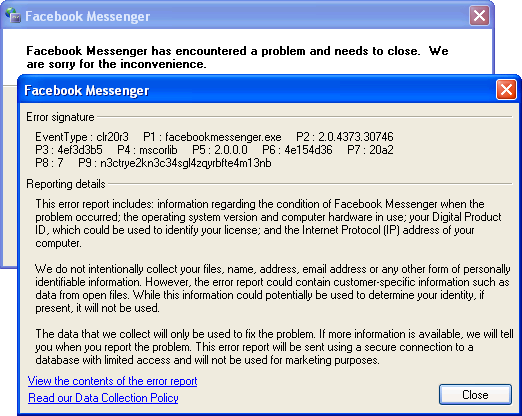 Facebook recently launched ‘Messenger for Windows’, a desktop client for Facebook chat. What kind of computer operating system do I need in order to use Messenger for Windows? You can set up the app if you use Windows 7 on your computer. Looking at the executable in .NET Reflector, the program uses the functions DwmSetWindowAttribute and DwmExtendFrameIntoClientArea, which are not available in Windows XP. I suspect that adding support for that operating system wouldn’t be very difficult, however, as the program is little more than a couple of WebBrowser controls (the heavy lifting is not done on the client side). If you look closely, you’ll notice that the font is Microsoft Sans Serif, not Segoe UI (the latter is the user interface font in Windows Vista and newer – MS Sans Serif hasn’t been the default since Windows ME!). This is largely Microsoft’s fault – MS Sans Serif is the default font in the Windows Forms designer even in Visual Studio 2010 (and the issue has been around for a long time) – but it’s something that the Facebook developers should have picked up on. Interestingly, the developers chose to use the CS_DROPSHADOW window class style to draw a shadow around the window even when the DWM is disabled. Given that Google returns fewer than 10,000 results for CS_DROPSHADOW, this must be one of very few applications to use that feature. The program doesn’t respect the operating system’s language settings – the notification area icon’s menu is displayed in the language that the user selects on Facebook. Finally, the docking functionality is implemented by using an application desktop toolkbar (appbar). I haven’t seen many programs use appbars, so it’s neat to see one in action. They updated it to work on XP as well but it is just a stupid web app. I find fTalk much better for Facebook chat. As long as you are careful not to install the bundled toolbar.